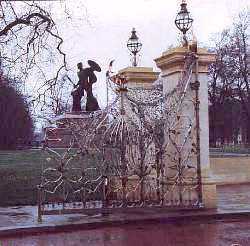 Queen Elizabeth Gate, Hyde Park, London. This picture is a link to a larger view. This new entrance to the park is a tribute to Her Majesty Queen Elizabeth the Queen Mother. The six gates, railings and lamps are made from forged stainless steel and bronze. All colouring is from heat and natural oxides. The design spans the styles of this century with a formal and symetrical lower section which evolves into an organic freedom at the top. There is an illusion of lightness and delicacy only possible on this scale thanks to the properties of steel.